Happy Tuesday! Today we are sharing an easy new recipe that is 100% plant-powered and packed with goodness for your body. The best part? It is very versatile and can be a way to use up any leftover vegetables that you have kicking around in your fridge. The main base for the bowl is below, but feel free to swap out, remove, or add in anything that you want for veggies and greens. Other optional add-ins: 1 cup chopped sautéed mushrooms, 1 cup corn, or swap black beans for other bean of choice and/or quinoa. 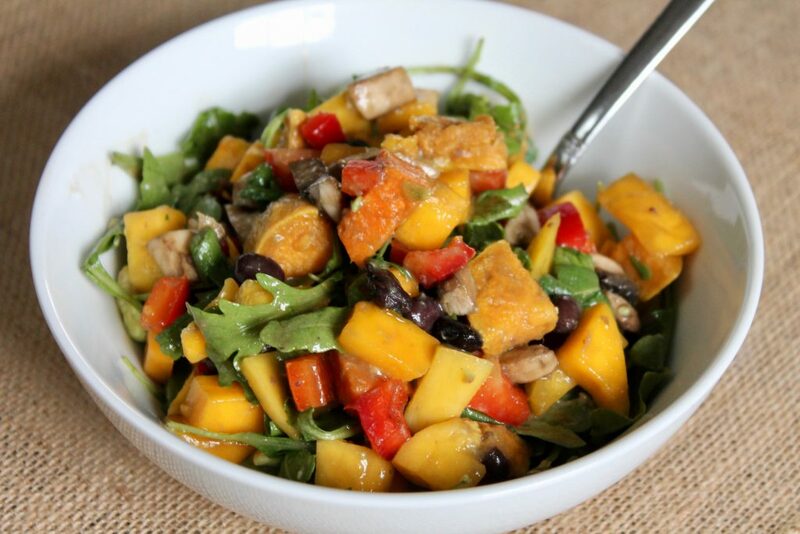 In a large bowl, lightly stir together the mango, sweet potato, avocado, bell pepper, black beans, scallions, arugula and cilantro. Mix in any other ingredients that you may be using, like sautéed mushrooms. Then, pour in the tablespoon of lime juice and two tablespoons of liquid aminos. Mix everything to combine and coat with the juice and aminos. Serve as is or over some cooked quinoa. 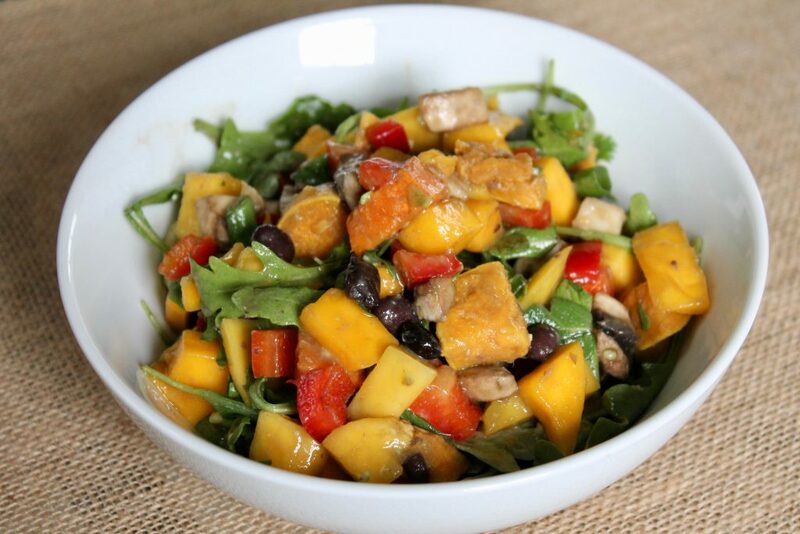 The juices from the mango and liquid aminos should be enough of a “dressing,” but if needed, simply drizzle in a little extra lime juice or liquid aminos. Feel free to change this recipe up as needed! We recently had only half a can of black and navy beans left, so we used both! We also tossed in some cooked asparagus! -Do not worry about getting exactly 4 cups of greens. Just lightly pack 4 cups or eye it. You can always add more later if needed. -Liquid aminos or tamari can usually be found near the soy sauce in your grocery store. They are healthier and gluten free alternatives to soy sauce, with great umami flavor, reduced sodium, and as you may have guessed from the liquid aminos name, contains amino acids necessary for your body. Want more recipes, meal plans, prep guides, workouts & more?